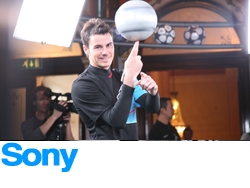 Billy recently performed the UK leg of his Sony European Tour for the 'Power of Images' event in central London. He displayed his skills for film professionals to test the latest Sony professional products and wide range of camera and lenses. 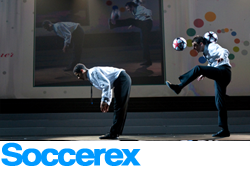 Billy joined his great friend and fellow freestyler Jeremy Lynch to perform their unique double act show for football's elite dignitaries at the Soccerex conference in Johannesburg, South Africa. Legends and VIP members of the audience including Sir Geoff Hurst, Franz Beckenbauer, Eusebio and Carlos Alberto. 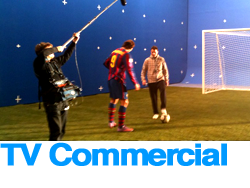 Billy worked behind the scenes of this summer's Nike commercial with Barcelona star Zlatan Ibrahimovic. Having worked together on the Joga Bonito campaign, Billy & Zlatan enjoyed some laughs and football skills behind the scenes for the ad, to be released in the run up to this summer's Fifa World Cup. 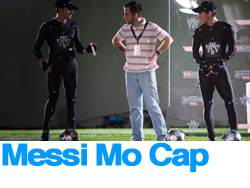 Billy choreographs the moves for the World player of the year, and good friend, Lionel Messi at the Pro Evolution Soccer Motion Capture shoot in Barcelona. The moves of both Billy and Messi will be part of the forthcoming Pro Evolution Soccer 2011. 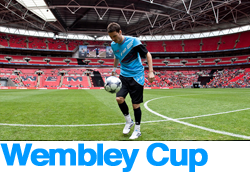 Billy performed as half time entertainment for the Wembley Cup, involving his beloved Tottenham Hotspur, World and European Champions FC Barcelona, Scottish giants Celtic and Egyptian and African champions Al Ahly. Celtic were the eventual winners. Billy choreographed the moves for Liverpool and Spanish superstar Fernando Torres for the global TV & print campaign for Pro Evolution Soccer (Winning Eleven) 2010, in Liverpool, England.